LOCH SHELDRAKE, NY (April 3, 2014) – Voting is now open to name SUNY Sullivan as the most innovative climate leader in higher education. 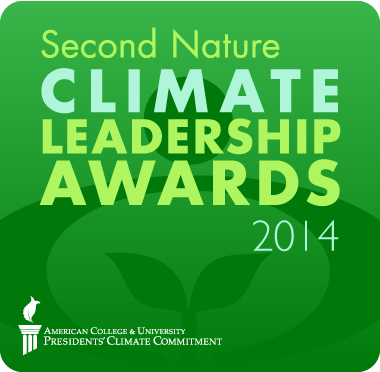 The college is a finalist in the 2014 Second Nature Climate Leadership Awards annual competition among US colleges and universities that are signatories of the American College & University Presidents’ Climate Commitment (ACUPCC). Voters can go to the Second Nature website at http://www.planetforward.org/idea/suny-sullivan-our-living-laboratory. After viewing SUNY Sullivan’s video, voters should click on the box “Do you think this helps move the planet forward?" Voters are able to view the video and vote daily through April 15. The awards program is sponsored by Second Nature, a national nonprofit that seeks to create a sustainable society by transforming higher education, and Planet Forward, an organization that engages innovators and publishes compelling ideas for some of society’s biggest challenges. SUNY Sullivan has incorporated such practices into both its curricula and its campus operations. In 2013, the college entered into an agreement with the company HelioSage for the construction of a 9-acre solar array on campus (which will join the college’s existing solar panel), built a 3-bay composting facility, installed a green roofing system, and began replacing its water fountains with eco-friendly bottle filling stations. The college also erected a wind turbine the prior year, and has been operating a geothermal climate control system that helps heat and cool its campus since 2002. This year, the award program’s fifth, drew the largest and most competitive pool of nominations to date. SUNY Sullivan was nominated as a finalist in the Associate/Tribal College category, based on its Carnegie Classification, wherein it joined fellow finalists Valencia College (FL), Gateway Technical College (WI), Glendale Community College (AZ), and Montgomery County Community College (PA). Second Nature will partner with Planet Forward, a web-to-television initiative that documents and shares energy, climate, and sustainability advances, in a public voting competition featuring the finalists’ climate leadership and campus innovations during Earth Month (April 2014). Finalists will produce videos promoting their sustainability efforts, and public voting will open during April. The Second Nature Board of Directors will choose the winners in late Spring 2014. For more information on the awards, visit www.secondnature.org/awards. To read more about SUNY Sullivan’s sustainability initiatives, please visit www.sunysullivan.edu/SustainableSullivan.